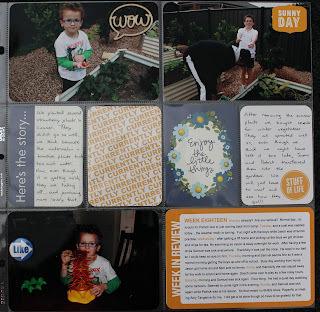 Hi, and if you are visiting as part of the Life Paper Scrapbook blog hop Welcome! We were told we could pick any topic for our blog post. I hope you like what I have chosen. My week 18 is a good way to demonstrate my answer when people ask "why do you do Project Life?" 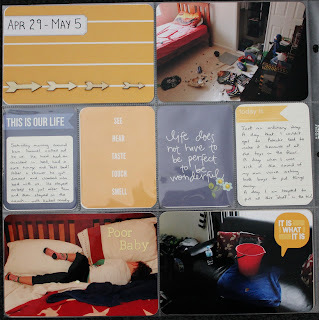 or "why do you do Project Life instead of 'traditional' scrapbooking?". I did my first scrapbooking class with Kaszazz almost 5 years ago. I loved the creative process....I loved the papers, embellishments, tools and I loved that I could get my photos off the computer, out of drawers and into albums. But what I found was that I could never keep up scrapping all the photos I was taking. So the number of photos on the computer grew. Sure, I would go through and print a lot of photos too.....but they just added to the number of photos in the photo drawers and boxes (I had started sorting the boys photos into their own boxes). I would go crazy on scrapping retreats trying to get as many photos scrapped as I could, but still ended up just scrapping the "big" events. And, of course, I spent a small fortune on supplies to scrap all these photos! And then I found Project Life...and the Project Life groups on Facebook. I observed for a while, before taking the plunge. And boy, it was a big plunge! I have managed to sort, discard and scrap all the photos in the drawer into various albums and it feels great. There are NO photos in the drawer waiting to be scrapped or put in albums (Hooray!). At the start of this year I began our first family Project Life album. I don't do 'photo a day' which means some weeks I have a few photos and other weeks I have lots of photos. Most weeks the photos are a mix of my boys, what they are up to and random things that appeal to me at the time. But the part I like most is that the photos really do reflect our life...as it is. So, without further rambling....here is Week 18. This week I decided that, in addition to items from the BH Seafoam kit (the dark yellow this week) I would add some blue to my spread in the form of journalling and filler cards from the Pebbles range. (This has nothing to do with the fact I follow the West Coast Eagles right?) The left hand side of the page shows how 'real' the week was.....untidy rooms driving me mad and a sick 5 year old who needed a bucket all weekend. The speech bubble "It is what it is" from Studio Calico was so appropriate. The right hand side called for more embellishments in the form of a wood veneer (Studio Calico but purchased from Polka Dot Creative), another Studio Calico label, some enamel dots from Scrap Therapy - the yellow centres on the flowers - and a flair from Greatest View). And here is what the weekly spread looks like together. Hope you've enjoyed reading this post, and that your journey through the Life Paper Scrapbook blog hop is an inspirational one. If you are following the order, please click LPS Blog Hop - Next Stop to go to your next stop. 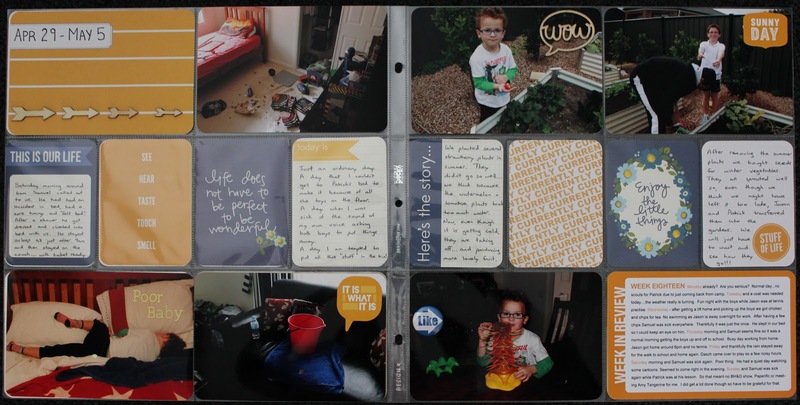 And don't forget to enter one of your Project Life layouts ENTER HERE in the LPS competition to WIN a mini kit and album. Thanks for visiting and would love to hear why YOU do project life. For reference purposes, here are all the blogs participating in today's blog hop. I am being totally inspired by the hop so far. I do Project Life to record all the minor as well as the major events in the life of my family. I am usually a couple of weeks behind but it does mean we are printing and using our images. Loved your post Amanda :) I love reading other perspectives on PL :) Thank you so much for the inspiration! great post Amanda. So fantastic you have no photos in the drawer waiting to be scrapped! 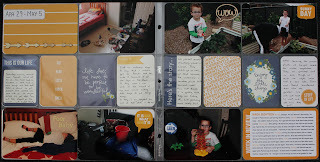 i still enjoy traditional scrapbooking, but have found PL makes the whole process much easier and gets the photos into albums and documented much quicker.